Kleiner Perkins Caufield & Byers partner Mary Meeker recently shared her annual Internet Trends report for 2016, showcasing a presentation of 213 slides covering a range of topics from global life expectancy to the ongoing market battle between iOS and Android. 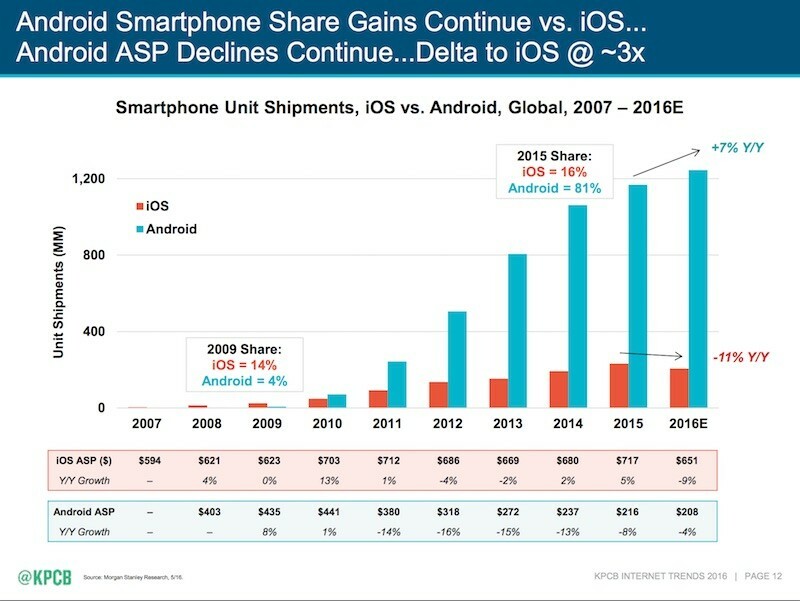 Concerning the specific battle between iOS and Android, Meeker notes that over the past six years iOS has seen just a two percentage point increase in market share, while Android has exploded from a 4 percent presence in the industry in 2009 to a massive 81 percent in 2015. 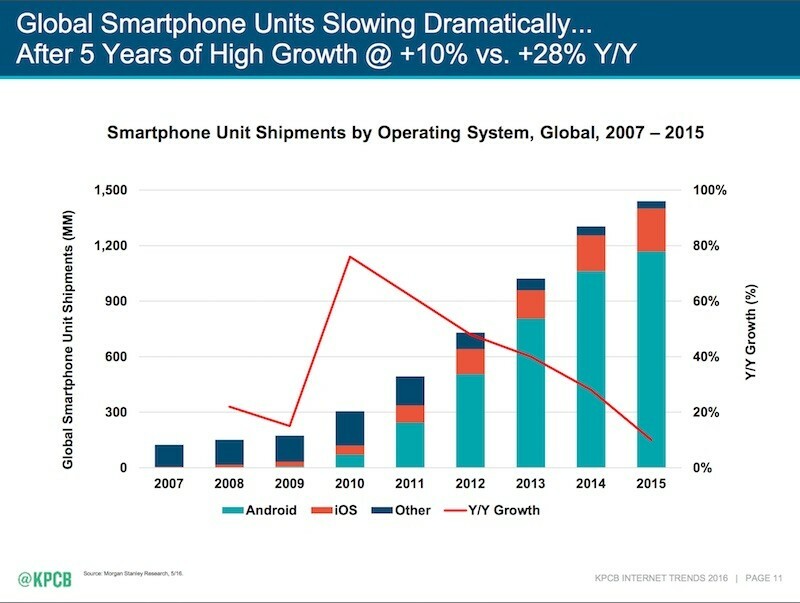 The pattern is expected to continue, with Meeker projecting iOS will see a year-over-year loss of 11 percent in unit shipments as Android climbs another 7 percent in 2016. Due to Apple's introduction of the lower-cost iPhone SE -- and the cheaper price tag of smartphones in the company's expanding global markets -- Meeker also expects Apple's average selling price per unit to dip this year for the first time since 2012. In that year, ASP dropped only 4 percent (from $712 in 2011 to $686 in 2012), but now the company is predicted to see a 9 percent decline in ASP (dropping off from $717 in 2015 to $651 in 2016). Unlike in years past, global smartphone unit shipments are slowing "dramatically," for both Apple and Android-supported devices. Expansion for the smartphone market as a whole has stagnated, going from a peak in 2010 at nearly 80 percent year-over-year growth, to just about 15 percent in 2015. Global smartphone user growth is seeing a similar slow-down; understandably, the largest markets with the least amount of smartphone proliferation have the biggest upticks in year-over-year increments. These include Asia-Pacific, which has seen a nearly 20-percentage-point increase in smartphone user share over the last seven years and now accounts for over half of the total market. Apple has been attempting to gain a larger foothold in these countries, notably seeing strong performance in China in recent years and looking toward India as its next area of focus. Low-cost devices -- and a larger number of potential customers without a smartphone -- in areas like the Middle East, Africa, and Latin America also presumably helped those territories come out on top in the total rankings for global smartphone user growth. Earlier in April, Apple reported its first year-over-year decline in revenue since 2003. The news led to a string of reports addressing the company's declining stock value and various "peak iPhone" comments concerning its potential inability to continue to grow in certain markets, especially where its flagship smartphones see annual releases without much dramatic distinction between models. Meeker's tamped-down expectations for 2016 mirror these concerns, particularly regarding the increasing belief that the 2016 iPhone 7 and iPhone 7 Plus will be iterative updates on the current iPhone 6s line, using a largely similar design but with new features like a dual-lens camera and Lightning-enabled headphone connector. An uptick is now projected for 2017's "iPhone 8," which is seeing rumors surrounding everything from a massively redesigned bezel-free display that features a dual-curve OLED screen to truly wireless charging. 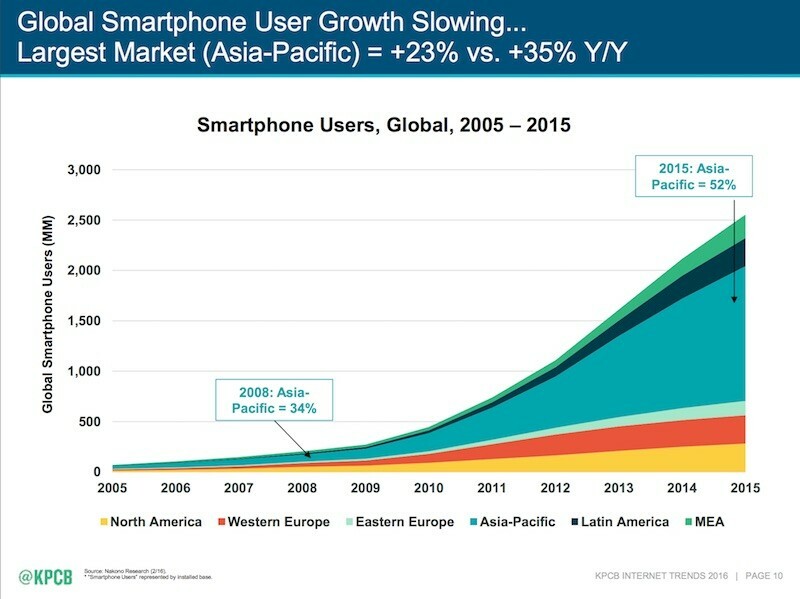 Mary Meeker's 2016 Internet Trends presentation, and a download of the full PDF, is available on KPCB's website. Maybe if Apple wasn't so obsessed with released 16 GB iPhones for $700-$800 then that percentage could be higher. What an original and informed comment. Very helpful. As an Apple fan (and not a a shareholder) I could care less about how much money they make, as long as they have enough to stay in business and make good products. I hope that the slide in market share will push them to accept lower margins and bring out better products. I wish some of these 'analysts' would do a comparative report on profitability of iOS vs other software over same period of time... What is the use in being a market leader when your profits are wafer thin? I keep reading about "profitability". It's good for Apple but what does profitability mean for you? Is Apple adding new features/hardware? The answer is no. Apple fanboys are the reason why these crappy iPhones are selling like hot cakes. There is no innovation. The first version of iPhone is a true innovation in terms of product appeal. Pricing is completely wrong. iPhone is overpriced by at the very least $300. I love the iPhone but you're absolutely right. Look at phones like the Nexus 6P and the fact that right now, you can get it unlocked for $450. You can't help but feel you're getting ripped a new one when buying an iPhone for $300 more. The more sales and money Apple makes, the more money they have to plow back into R&D to improve their products and come up with new product. In theory, this is correct. What we have unfortunately seen is Apple NOT reinvesting their $150B+ back into making the most cutting-edge smartphone on the market. A poster the other day said that Apple has gotten incredibly good at understanding the bare-minimum that they can get away with, while still selling phones. What did you expect? "Wow, I feel so bad for Apple. They release 16 GB!!! phones and they still don't get that many sales? Urgh the Android fanboys!" 1) Android makes way more budget phones than Apple. 2) Android really has come a long way since 2009 in both software and hardware offerings. Competition is good for any company, especially Apple. I'm more convinced about this having to do with iPhone and iPad pricing. This isn't a good situation at all. iOS is a great platform and more people should be able to access it with a new device, not a device that is years out of date. No one will come to iOS if they can not afford to. Customers are actually moving away from iOS to Android, they are voting with their SIM and exiting the Apple carnival. No more clowning around. What other sign does Apple require to understand this basic issue. Pricing is completely wrong. iPhone is overpriced by at the very least $300. This is straight to the point and completely right on. Reducing prices is the only way that Apple can increase their market share. There are a lot more people that want Apple products, especially in the developing world, but cannot afford them.